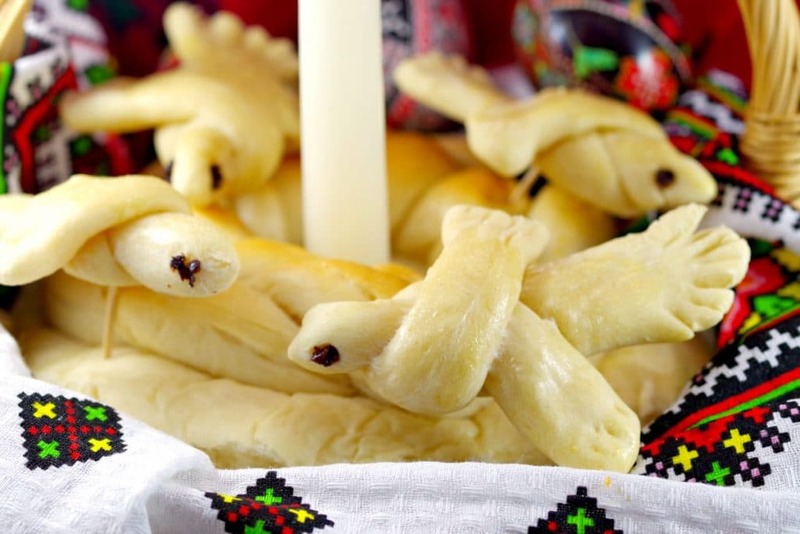 I remember seeing these Ukrainian Easter Doves (Holuby) as a kid, but they were on fancy towers of bread and did not look like they were edible. In fact, some of them would have actually been varnished to preserve them. I was really glad when I could make them and actually eat them. It was like a childhood fantasy come true…. And now you can too! These cute little edible ornamental doves are used to decorate the Easter baskets that carry bread to church on Easter Sunday as an offering. I make them because it’s tradition and I decorate my Ukrainian Easter bread (recipes below). Easter doves are fun and easy to make with this simple step by step tutorial! In an earlier time in Ukraine, on the Holy Day of the 40 Martyrs, (March 9, O.S; March 22, N.S. ), the return of the birds in the spring was celebrated with special spring songs (vesnianky). Birds made of dough were also baked representing the larks that were migrating back to the north. Today, these bread “doves” still symbolize spring and are made for Easter. 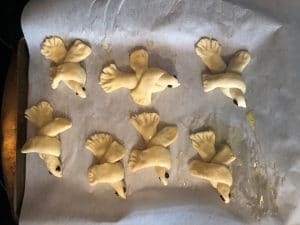 These doves are also used to decorate wedding bread called Korovai, a traditional bread used at weddings and anniversaries that symbolizes family and community. The Korovai is decorated with these ornamental baked doves: two birds represent the couple, and other dove ornaments represent family and friends. To Ukrainians, bread is kind of a big deal. In fact, Ukrainians regard bread as one of the holiest of foods. Not only is it brought to church on Easter Sunday as an offering, it used to greet honored guests at home. Ukrainians celebrate almost every holiday (Christmas and Easter) and special occasion (like weddings and anniversaries) with bread. And if you ever have the honor of attending a traditional Ukrainian wedding, you will marvel at the towers of elaborately decorated breads. Easter doves are great way to celebrate Easter and a fun family Easter activity to do with kids! They are also ideal to make with larger groups of kids. In fact, it’s so easy that I did this with a class of 8 year-olds when my son was in Grade 3 and my daughter’s girl guides group (ages 8 and 9) and they loved it! A complete step by step photo tutorial is in the directions below but I printed this out and gave it to each child (it really helped)! Here are some EASY BREAD MACHINE Ukrainian Easter Babka Bread & Paska Bread Recipes to go with your Easter Doves! Combine the first 5 ingredients. Add one cup flour. Mix well with a wooden spoon. Add another two cups flour. Knead by hand on a floured surface. If more flour is needed, add a little at a time. 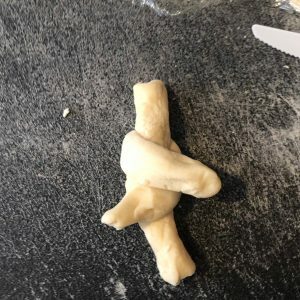 The dough should be thick, like play dough. Roll out the dough into snakes about the thickness of a finger; cut into 2 - 4 inch sections. Pull the arm of the strip beneath up and cross to the opposite side. Let rise for 5 minutes, then place the doves in a preheated oven for 10 minutes. 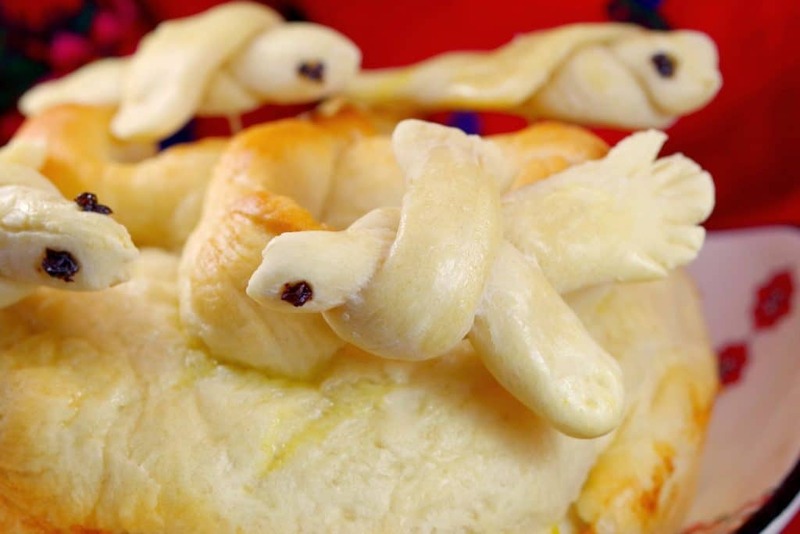 Insert a toothpick on the bottom of each dove to enable insertion into decorative ritual breads (see photos in post).